Fab Lab Connect partnered with Parrot to bring new heights to flight dynamics and coding in the School Fab Lab Makerspace curriculum. 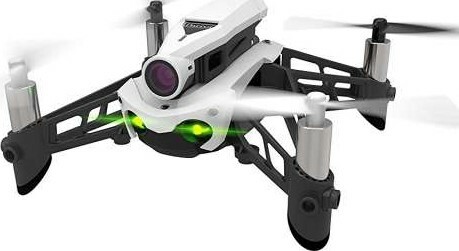 Now, instructions on how to control the drones overhead and high in the sky are demonstrated in a simple and logical new Parrot drone guide video. It’s a split-screen video, with animation on one side, and live-action drone movements on the other. Proper control of the drone – in this case, the Mambo model – will help ensure safety and fun. Watch the “Parrot Mambo Flying Guide” video here. To touch on the basics, drones are unmanned aircrafts, also known as unmanned aerial vehicles (UAVs). A drone is essentially a flying robot that may be remotely controlled or can be programmed to fly autonomously through software-controlled flight plans. Using GPS sensors and simple programming software, drones can be useful for many functions that manned vehicles may not be suited for. In School Fab Lab workshops, students learn about drones by piloting them, using terminology such as yaw, pitch, elevation, longitude, and latitude. Some outcomes learned are aerodynamics, operation, and aviation safety. Applications such as Tynker enpower students to become makers. Students practice and strengthen problem solving, critical thinking, mathematical calculations, visualizing processes and autonomous navigation. They acquire crucial 21st century skills and learn to innovate across multiple themes based on their interests. To learn more about adapting the School Fab Lab curriculum – which includes Parrot drones and Tynker coding – schedule a Consultation HERE.